Dear Editor: When you set out to make Flash, No. 180 the worst issue ever, you certainly succeeded beyond all expectations! You did make it bad on purpose, didn’t you? After all, a story that poor couldn’t have been written that way accidentally! 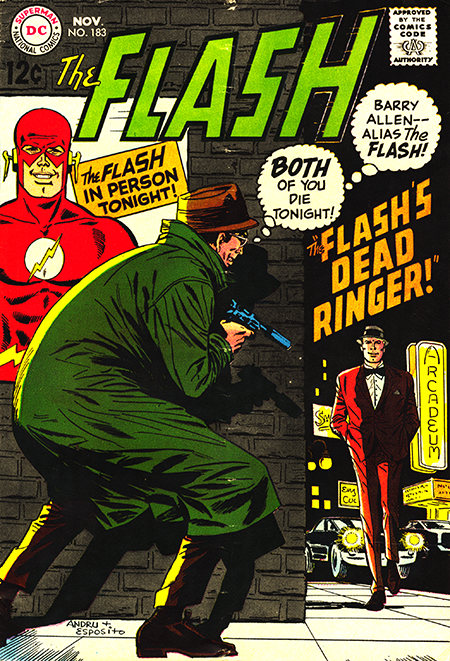 All kidding aside, this was the worst of all issues of Flash that have yet appeared (note that I said “yet” – as of this writing, I haven’t seen the conclusion of “The Flying Samurai”). I don’t want o discourage a new writer but the camp craze has been over for months, so there is no excuse for Frank Robbins’ story. The flimsy plot, inane dialog, and “cute” remarks in this issue were even worse than the when the craze was at it’s peak. When I reached the second panel on page 21, I was ready to give up… but when I discovered upon turning the page, that you were going to inflict inflict another of issue of this torture on us, I was so disgusted that I had to reread my entire Flash collection order to find the strength to go over the issue once more, so that I could tear it to pieces… in this letter that is! The art didn’t help matters any, either. I’ve never cared for cared much for the team of Andru-Esposito, and all I have to say is that their art on this story did nothing whatsoever to change my opinion of them. All I can add to that is a retroactive “well put, Gordon”. Hey, speaking of the letters page as we just were, a fellow Flash Grams alum showed up at my talk/signing in Lakewood, Ohio just before Christmas. He told me his name and, as is my wont, I neglected to write it down. So, if you’re reading this, my friend, please email me at this site so I can give you a shout-out when I get to the issue containing your letter.